This popular lotion will be a best seller at your next craft show. 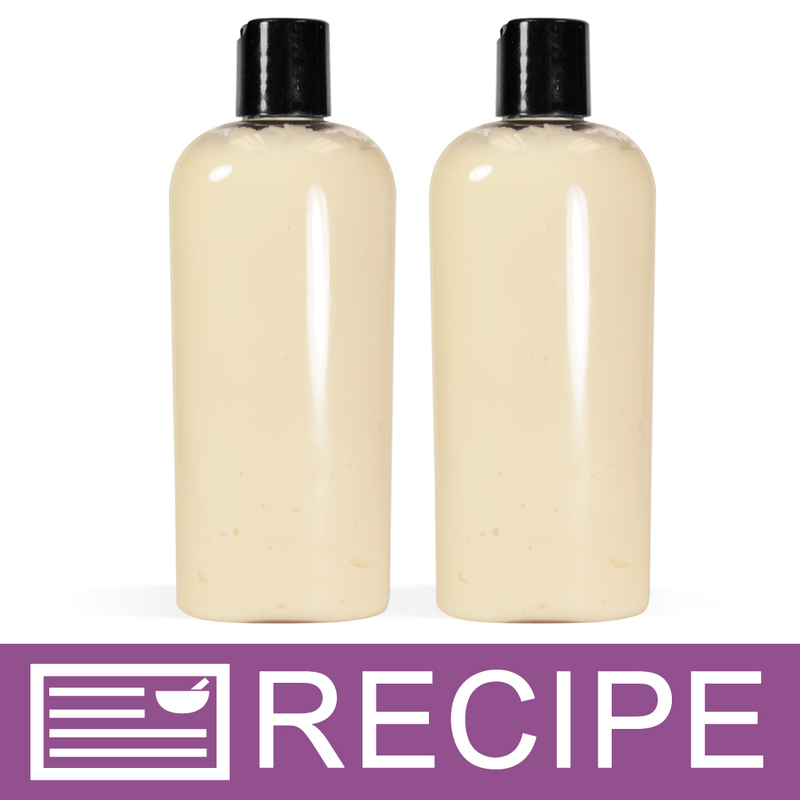 Customers will love the oatmeal, aloe butter, grapeseed oil, and babassu oil used in this lotion making project. Create a thick soothing lotion from scratch with this lotion making project. The handmade lotion made with this lotion making kit will leave skin silky smooth, and smelling of juicy plums with whipped caramel with a hint of bourbon vanilla and jasmine. The oatmeal in particular soothes dry skin while the aloe butter, grape seed oil, and babassu oil moisturizes. Package this in the included clear plastic bottles with disc tops then finish with a label to sell. You Save $22.30 by purchasing this kit rather than buying the items separately. "Love the lotion, but not the fragrance"
COMMENTS: First off, I think it’s important to mention that I am a total newbie to lotion making. I took the first step with this kit. I seem to have sensitivities to many products and have wasted a lot of money over the years trying to find the right products for the right seasons. The aloe butter and colloidal oatmeal in this emulsified lotion were appealing because I generally have some luck with products that contain colloidal oatmeal, but then find that they are not quite moisturizing enough, especially in the winter. The kit was easy to use and I’m very happy with the way the finished lotion feels on my skin. I generally use unscented products and would have left the fragrance out of this recipe, but I was concerned that leaving it out would change the chemistry or the consistency of the final product. I consider the fragrance to be strong in the final product and I can smell it on my hands even after washing them. It’s an issue I considered before buying the kit, so I am still giving it 5 stars. My early opinion is that this lotion recipe would work well for me without the fragrance oil if it’s possible to make it that way without compromising the recipe. If you can advise me on that aspect, I will likely try it again. The only thing I would add is that some directives on temperatures for the water and melted waxes would be helpful in the instructions. COMMENTS: This lotion was easy to make and turned out great! I substituted the fragrance for a holiday scent. Smells fabulous. I have a show this weekend, so I'll see what others think...But I give it 5 stars (*****)! Just be aware that it is supposed to sit overnight before bottling. I almost waited to late to make it for my show because I didn't see that instruction! "Oatmeal and aloe lotion kit"
COMMENTS: I was a little intimidated by this kit at first, but after making it I absolutely love it! The scent is perfect, the lotion is light and absorbs easily. No greasy feeling here. I am excited to add lotion to my product line with this great lotion. COMMENTS: This is a great kit. I love the lotion my skin is soft all day. Even after washing my hands several times during the day. COMMENTS: My customers love this one. Great everyday lotion that soaks in fast. Very pleasant and not overwhelming scent. COMMENTS: I only offer lotions and scrubs to compliment my cold processed soap line. This kit is similar to what I'd want in a lotion if I formulated it myself. In the future, I will be ordering the ingredients separate to make this in bulk and offer a few additional fragrance choices for my customers. I wish I'd known how fabulous this was and how much of a hit it has been or I'd have made it when I bought it eons ago. Cannot wait to make more! I did not use the caps that came with this kit ... I happened to have pumps on hand and used those instead. Giving it a 5* because the things I would change are just personal preference. COMMENTS: I made this lotion and found it to be very thick. It is so thick I find it difficult to get out of the bottles provided. I do love the feel of the lotion and I like the fragrance. It is a light and gentle fragrance, but pleasant. There were a lot of ingredients which required a lot of measuring...so it takes some time to put this lotion together. COMMENTS: I made this lotion from the kit today. I took me quite a long time than I thought since I wasn't seasoned crafter, but I absolutely love the lotion. Very moisturizing with all the good ingredients and the smell's so good. I can't wait to make the label and let other people to try it. COMMENTS: This lotion kit came with everything but the distilled water. It was easy to make. The scent that came with it Caramel Woods is amazing. The feeling the lotion leaves is smooth and silky. Hydrates and soothes dry skin quickly. Great absorption. COMMENTS: Very easy to make and so smoothing on the skin! COMMENTS: This was my first time making handmade lotion and it turned out great. The recipe is very easy to understand. It makes you skin soft and is better than store bought lotions in my opinion. My mother and best friend love it also. COMMENTS: FANTASTIC!! This is absolutely the best! The lotion is so good for the skin and the fragrance is amazing! All my customers just love this lotion and fragrance. Both men and women alike!! I did put mine in Malibu Tubes instead of the bottles that came with it because the lotion is thick. I will use the bottles for something else. Great going WSP!! Thanks you for such great products and service! "Oatmeal & Aloe Lotion Kit"
COMMENTS: This kit, oatmeal and aloe makes amazing lotion! I started making my own, but I became tired of not hitting the nail no the head...decided to try this kit, and I am so thrilled I did. NO greasy feel what-so-ever! Skin feel silky soft...thanks WSP! COMMENTS: Amazing! I enjoyed making this lotion from scratch and the smell is just amazing! I hated that the recipe called for the entire 2 ounces of Caramel Woods Fragrance Oil - but I quickly ordered another and I feel the scent is going to be a great addition to my fall / winter soap line! The lotion smells amazing, absorbs quickly with no greasy feel! I'm very excited to offer this to my customers. I know they're going to love it! COMMENTS: When I first made this I was not thrilled with the scent. Now when I pickup the bottles I have for my husband I love it. It really is a great lotion for dry skin. Will buy more of this and highly recommend for dry skin. COMMENTS: Oh my gosh, this is the best. Everyone I've shared this product with loves it. This so good I had to order some more. This lotion leaves your skin feeling so moisturized. My daughter and her son have itchy skin conditions, this works wonders for both of them I use it on my back, this is absolutely wonderful and the fragrance is so calming. Thank you so much for this kit!!! • The oatmeal powder and the fragrance. • a sound end product. COMMENTS: My customers love it, this is my second time buying the lotion, I know will be buying this from now on. smells great, sets nice, I poured into the bottles last time, worked just fine. COMMENTS: As the product states, this lotion is made from scratch. I made sure I had sufficient time with no interruptions because it takes a lot of ingredients, but oh, it was so worth it. The fragrance is soft, not harsh, and the end product leaves the skin moisturized but not greasy at all. This will definitely be a lotion I will continue to make for my customers. "Easy to make lotion kit"
COMMENTS: This was my first time making lotin from scratch. It was very easy kit to start with. The directions are great. And I'm not going to lie, I pulled the video up as well to follow along with. The lotion is non-greasy and has a nice fragrance. I would buy this kit again. "Soft lotion that's easy to put together"
COMMENTS: I only make these products as a home hobby for myself and gift-giving. I bought this lotion kit to make some "girlfriend" Christmas gifts. The kit made sense as it saves significantly off the price of individually buying each item for this small batch. My batch made about 68 ounces, slightly over the 8 bottles included, which was very nice. The caramel woods fragrance is pleasant, even for someone like me who is not normally fond of vanilla based scents. The only problem I had with the instructions was the definition of "thickened" in the combining phase. I wasn't sure whether I was going for a soft peak stage or something else. Turned out to be something else I call "scrambled egg" (that thickness you feel when you beat the eggs to make scrambled eggs). Otherwise, the formula was easy to put together. I bottled using a large piping bag which worked well, although patience is required to get the last inch of product into the bottles. My kit inadvertently sent the wrong sized caps, but an email to customer service righted that problem. The finished lotion is nicely thick and creamy, but dispenses from the bottle well. It performs very nicely, leaving my hands soft and moisturized for several hours, where I don't feel like I have to put more on every hour. I would make this again using any of my favorite fragrances. COMMENTS: Love, Love this lotion. First time trying a kit and I must say this one was easy to make. The finish product is amazing, leaves skin soft and moisturized. Doesn't leave that greasy feel. I will order again. Also smells oh so good. COMMENTS: I like to try a lot of things. This year my daughter got involved in the process. (she is 25). We made two of these kits yesterday. They are great! The lotion goes on smooth, does not leave a residue and is non greasy. In comparison studies, much better than the lotion from B & BW! I hate putting lotion on my legs and putting on pants when it is still greasy...eww...This applies easily and absorbs nicely...no stickiness. "I made this a few weeks ago and liked it, but when I went to put labels on the bottles they had mold (DOS). What could’ve happened? I didn’t vary from the recipe except at step 10, I let the lotion cool completely before adding the oatmeal and preservative. Thank you." Staff Answer We are not sure why this would happen. Be sure you were using fresh oils and that the ingredients were well incorporated. You would not have mold growing in just a few weeks if a preservative was used. "Can I add your powdered Goat's Milk to this recipe? If yes, how much, and do I need to increase the amount of preservative? Thank you for your help and time!" Staff Answer Yes, you can add goats milk powder to this recipe. The recommended usage level for lotions is 2-10%. We would recommend increasing the preservative to 0.80 oz. You are responsible for testing to be sure the product performs correctly. "Can I add magnesium oil to this? Also how would I do that since it’s more of a water then an oil? " Staff Answer If you add additional oils you will need to adjust your emulsifier. We really can't determine performance without testing. You are creating an entirely new formula that would require performance assessment. "Am I able to use Optiphen ND in place of Preservative-Sorbic Acid +2 PF in this recipe? I also see that you added Isopropyl Myristate to the recipe. Is this needed? It was not on the recipe when I purchased the kit. Thank you for your assistance! " Staff Answer The Optiphen ND can be used in place of the Optiphen Plus. You can use the same amount that is stated in the recipe. The original recipe called for Cyclomethicone, which has been discontinued. We have replaced that with the Isopropyl Myristate which gives the lotion a soft, silky feel. "Can I add magnesium oil to this recipes?! I'm looking for a magnesium lotion recipe that includes a preservative so I can sell!" Staff Answer Since we do not sell this product, you would need to test the lotion to see how it performs with the added oil. "Why was the Cyclomethicone changed to Isopropyl Myristate and why was the Vanilla Stabilizer added?" Staff Answer WSP has discontinued Cyclomethicone so this ingredient was substituted with the Isopropyl Myristate which will help take the greasy feel away and gives a silky feel to the lotion. We added the stabilizer because the Caramel Woods fragrance oil contains 6% vanilla. If you choose not to use the stabilizer, you can certainly leave it out. "Can I substitute Dimethicone with Clymethicone with the same amount as the recipe?" Staff Answer You can use dimethicone in place of cyclomethicone in the same amount. Be sure to change the ingredient label if making this substitution. "Can the water be substituted with beer or wine in this recipe? " Staff Answer Since this recipe was made with water, you would need to test making this with wine or beer. We do have lotion recipes using both beer, wine and champagne. "Is the Vitamin E in this recipe meant to be a preservative?" Staff Answer Yes, this lotion is paraben free. You can tell this by checking the ingredients. Preservatives would list methylparaben and propylparaben but this preservative is paraben free. "Can this be used in a pump bottle? " Staff Answer You can use a pump top for this lotion. "Could this recipe be made without the fragrance then used as a lotion "base" that would allow me to add fragrance of a customer's choice? Thanks!" Staff Answer Once the lotion has emulsified, we are not sure if it will hold the fragrance. This may need to be whipped into the lotion when adding. This is something you will need to test. "Is it possible to pour this into the bottles to sit to thicken overnight instead of a bowl then piping into bottles in the am. (resulting in less air bubbles in the bottle)Thanks"
Staff Answer We recommend following the recipe because as the product cools it will produce moisture (condensation) that will not contain preservatives. If in a bottle that condensation may drip back into your product potentially causing mold. To reduce air bubbles, tap the bottom of the bottle on a table to 'burp' the product and release air bubbles as you slowly fill each bottle. "I just got through mixing all of this from the kit and it is runny like milk. What should I do if it does not set up by morning?" Staff Answer The product should set in the next 24 hours, Jennifer. If it does not, please give our Customer Service representatives a call at 1.800.359.0944 for assistance. I'll answer my own question.... came back to this in the morning and it had set up. 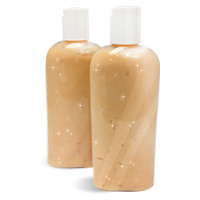 "I made this kit, following the directions, but my lotion turned out really grainy. Is there a way to fix this after the fact? Any idea what went wrong in the first place?" Staff Answer We're sorry to hear it didn't work out as expected! Our best guess is that the emulsifying wax was not completely melted before the oils and butter were added. This is not something that can be fixed after it has been made, but it will still provide excellent moisture to skin. "What percentage of ingredients would be considered natural in the Oatmeal & Aloe lotion? " Staff Answer This recipe is made from 88.49% naturally derived ingredients. "Does this lotion kit make lotion that would be considered vegan?" Staff Answer Yes, this recipe is a vegan recipe. Non of the ingredients listed in this recipe are derived from animal or animal by-products. However, we do not carry vegan certificates for any of our products. "Can I substitute the aloe butter with shea butter and the Babassu oil with apricot kernel oil? If so would I need to recalculate the stearic acid, wax and cyclomethicone?" Staff Answer You should be able to substitute both the Aloe Butter and Babassu Oils in this recipe and not make any adjustments to the other ingredients. When any substitution is made to a recipe on our site, you are responsible for the final product.